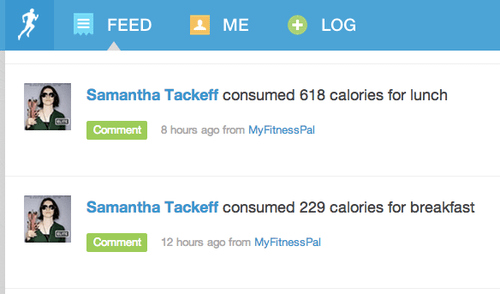 RunKeeper‘s (@runkeeper) recently announced integration with MyFitnessPal enables users to connect their accounts on the two systems to automatically sync MyFitnessPal tracked calories consumed (i.e. calories added) into RunKeeper while also syncing RunKeeper tracked fitness activities (calories subtracted) into MyFitnessPal. Weight measurements are also synchronized bidirectionally between the two systems so that your latest weight is consistent between the two. But there’s an added bonus for other RunKeeper partners and members of the Health Graph community. Both calories consumed and weight measurements synchronized from MyFitnessPal to RunKeeper are available to all Health Graph API developers. Calories appear as Nutrition sets with values in the calories field and weight measurements appear in Weight sets. Both of these nutrition and weight sets will have a source value of ‘MyFitnessPal‘ to indicate their origin. We hope that access to the additional MyFitnessPal-originated data will help you build even more amazing things for our collective user community!